Iron and steel casting refers to the process of injecting or pouring molten iron and steel into a mold to form an object of the desired shape. The process is normally used for mass production of components or parts used in a wide range of sectors such as automotive, agriculture, power generation, oil & gas, manufacturing machinery, and industrial units. Construction equipment need to be sturdy, strong, and long lasting. They need to incur low costs for maintenance and withstand varying pressures and different climatic conditions. This type of equipment also requires raw materials with excellent properties. Hence, iron and steel are among the most commonly used raw materials in the production of construction equipment. Iron and steel cast products are also used in other heavy industries such as automotive, mining, power generation, manufacturing machinery, oil & gas, electricals, and industrial equipment. In recent years, manufacturers have shifted their focus toward cast aluminum from conventional iron and steel products for use in automobile components, owing to superior properties of aluminum cast products such as lightness, corrosion resistance, and high performance. For example, the Aluminum Association’s Aluminum Transportation Group (ATG) explains that usage of aluminum components in vehicles can boost economy, owing to the lower total carbon footprint of aluminum compared to other materials, in terms of full life cycle of vehicles. The less a vehicle weighs, the less fuel and power are required. This, in turn, results in high fuel efficiency of engines and less carbon dioxide emissions from vehicles. Governments all over the world are planning to invest in infrastructure development projects. Developed countries such as the U.S., Canada, the U.K., France, and Germany are expected to invest in the maintenance of existing infrastructure projects while also developing new projects. On the other hand, developing countries such as India, China, Brazil, and South Africa are expected to invest in the development of new projects. Infrastructure projects such as railways, ports, bridges, manufacturing facilities, and industrial units require a considerable amount of iron and steel casting products such as steel plates and construction equipment such as loaders. These construction equipment also contain iron and steel cast components and parts. Thus, rising investments in infrastructure development are likely to boost the iron and steel casting market during the forecast period. Gray iron can be defined as a type of cast iron with more than 2% of carbon content and a graphitic microstructure. It is the most commonly used type of iron for casting purposes. It is relatively inexpensive, malleable, and durable. High use of gray iron can be ascribed to various factors such as its tensile and yield strength, ductility, impact resistance, and low production cost. High carbon content of gray iron also makes it easy to melt, weld, and machine into parts. However, market share of the gray iron segment is expected to decrease marginally, due to rising preference for other materials. On the other hand, the market share of the ductile iron segment is expected to increase during the forecast period. The segment is likely to be driven by the ability of ductile iron to be developed into low-weight iron castings. This reduces delivery expenses and offers economic benefits through other factors such as design and metallurgical flexibility. The automotive & transport sector is the major consumer of iron and steel casting products. High tensile strength and impact resistance of iron and steel cast products make them highly suitable for use in a wide range of automotive parts such as flywheels, reducer shells, braking systems, transmission cases, and investment castings. The automotive & transport segment is expected to gain market share by 2026, due to increasing use of private and public transport across the world. The share of the pipes & fittings segment is likely to increase, due to rising use of pipes and fittings made of iron and steel in industries such as power generation, oil & gas, and manufacturing. Nearly all types of iron and steel casting products are used in the production of pipes and fittings and associated components. Asia Pacific is the world’s largest consumer of iron and steel casting products. Consumption of these products in the region is expected to increase during the forecast period. This is because a wide range of iron and steel casting products are used in the region to manufacture end-products ranging from automotive components to appliances. Asia Pacific has several manufacturing facilities wherein iron and steel casting products are required. On the other hand, North America and Europe have managed to maintain their competitiveness. However, they are expected to lose market share by the end of the forecast period. However, the two regions are expected to lose less market share than Latin America and Middle East & Africa by 2026. A large number of companies operate in the global iron and steel casting market. Companies from Europe, Asia Pacific, and North America dominate the market with their vast expertise and technologically advanced equipment. Various players in the iron and steel casting market are also major producers of iron and steel. These players get significantly benefitted from backward integration, as it helps them control operational costs and access better technology. Some of the important companies in the market include Tata Steel Limited, Kobe Steel, Ltd., ArcelorMittal SA, Nucor Corporation, Hitachi Metals Ltd., and Amsted Rail. Iron and steel casting refers to the process of injecting or pouring molten iron and steel into a mold to form an object of the desired shape. The process is usually used for mass production of components or parts used in a wide range of sectors such as automotive, agriculture, power generation, oil & gas, manufacturing machinery, and industrial units. This report analyzes and forecasts the iron and steel casting market at the global and regional levels. The market has been forecast in terms of volume (kilo tons) and value (US$ Bn) from 2018 to 2026, considering 2017 as the base year. The study includes drivers and restraints of the global iron and steel casting market. 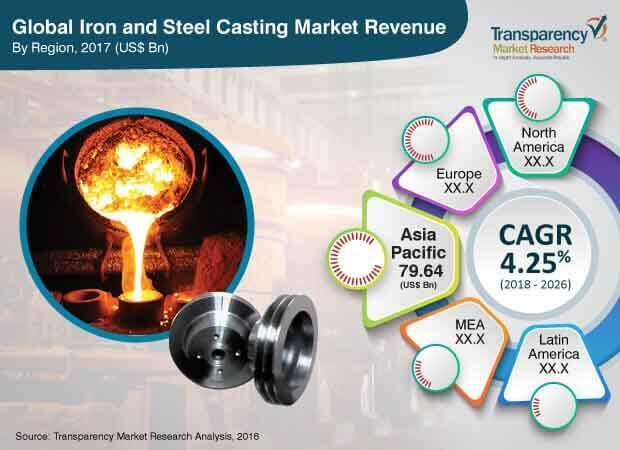 It also covers the expected impact of these drivers and restraints on the demand for iron and steel casting products during the forecast period. The report also highlights opportunities in the iron and steel casting market at the global and regional levels. The report includes detailed value chain analysis, which provides a comprehensive view of the global iron and steel casting market. Porter’s Five Forces model for the iron and steel casting market has also been included to help understand the competition landscape of the market. The study encompasses market attractiveness analysis, wherein material and application segments have been benchmarked based on their market size, growth rate, and general attractiveness. The study provides a decisive view of the global iron and steel casting market by segmenting it in terms of material, application, and region. In terms of material, the iron and steel casting market has been classified into gray iron, ductile iron, steel, and malleable iron. Based on application, the market has been divided into automotive & transport, pipes & fittings, pumps & valves, machinery & equipment, and others. These segments have been analyzed based on the present and future trends. Regional segmentation includes current and forecast demand for iron and steel casting products in North America, Europe, Asia Pacific, Latin America, and Middle East & Africa. The report provides the actual market size of the global iron and steel casting market for 2017 and the estimated market size for 2018 with forecast for the next eight years. Market numbers have been estimated for material and application segments of the iron and steel casting market. Market size has been provided in terms of global, regional, and country-level markets. The report comprises profiles of major companies operating in the global iron and steel casting market. Key players operating in the iron and steel casting market are Tata Steel Limited, ArcelorMittal SA, Nucor Corporation, Hyundai Steel Company, and Kobe Steel, Ltd. Market players have been profiled in terms of attributes such as company overview, financial overview, business strategies, and recent developments. In terms of material, the gray iron segment accounted for a major share of the global iron and steel casting market in 2017. High use of gray iron can be ascribed to various factors such as its tensile and yield strength, ductility, impact resistance, and low production cost. However, the share held by the gray iron segment is expected to decline marginally by the end of the forecast period, due to rise in preference for other materials. Based on application, the automotive & transport sector was the leading consumer of iron and steel casting products across the world in 2017. The automotive & transport segment is expected to gain market share by 2026, due to increasing use of private and public transport across the world. In terms of region, Asia Pacific held a major share of the global iron and steel casting market in 2017. Its share is expected to increase by 2026. This is because a wide range of iron and steel casting products are used in the region in order to manufacture end-products ranging from automotive components to appliances. Asia Pacific has several manufacturing facilities, wherein iron and steel casting products are required.